It’s Oscars time – so here’s a selection of websites to go with your Oscar-viewing parties, with all the information you could possibly need. 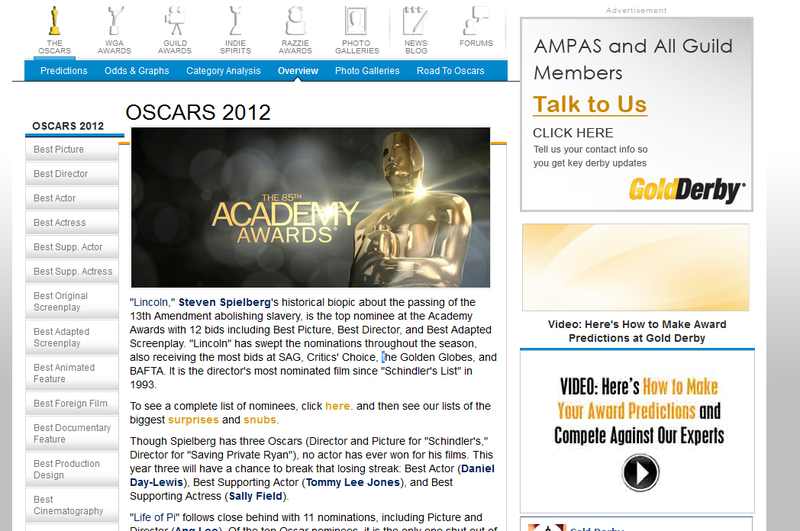 Let’s start with the official site – www.oscars.org – where you can catch up with every detail of the latest Oscars. For starters, you can see the Oscars that you won’t see on your TV this Sunday. 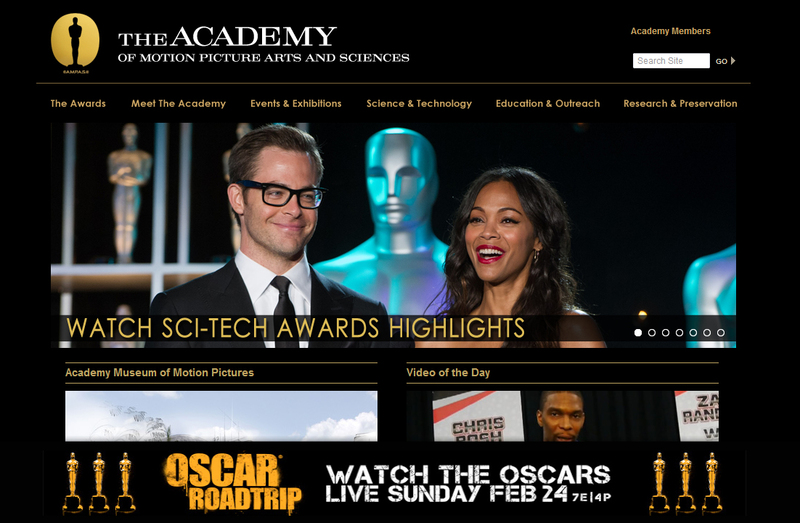 The Sci-Tech Oscars are presented at a separate ceremony, and you can watch the highlights of those online – to see if big hits such as The Avengers grab an Oscar to go with box office success. A lot of major movies don’t trouble the main categories, but sweep the board in the Sci-Tech area. The website will also tell you more about who the members of the Academy are – and has a host of information about the Academy’s outreach activities, and its film archive. Plus, of course, you’ll find every nominee listed here. 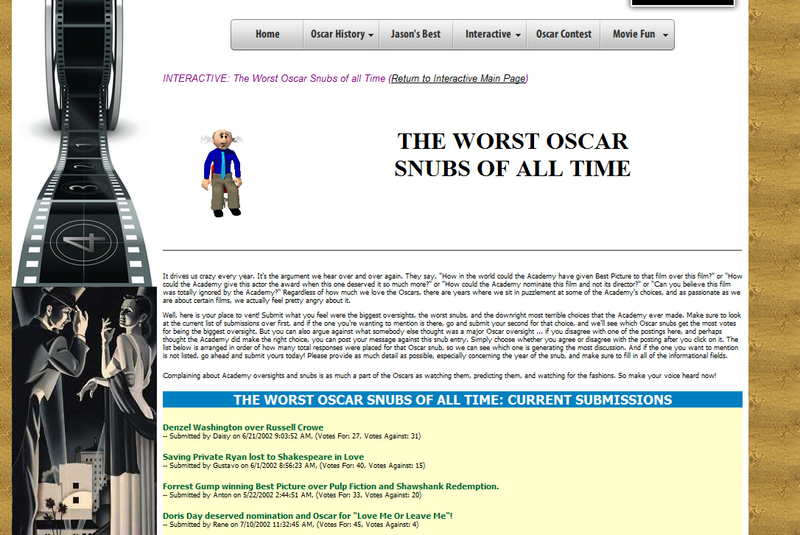 A fun site that’s full to the brim with Oscar information, this is one for the fans. Memorable Oscar speeches? Those are here. Best and worst Oscar moments? Check. Trivia by the ton? Yup. There’s even sections such as Worst Oscar Snubs Of All Time, where people get to vent about how on earth Saving Private Ryan lost out to Shakespeare In Love or how Forrest Gump beat Pulp Fiction and Shawshank Redemption. Visitors can vote for or against such rants. There’s also a movie quote quiz that can steal away no small amount of your time! President Obama’s re-election taught us one thing if nothing else: it’s all about the math. 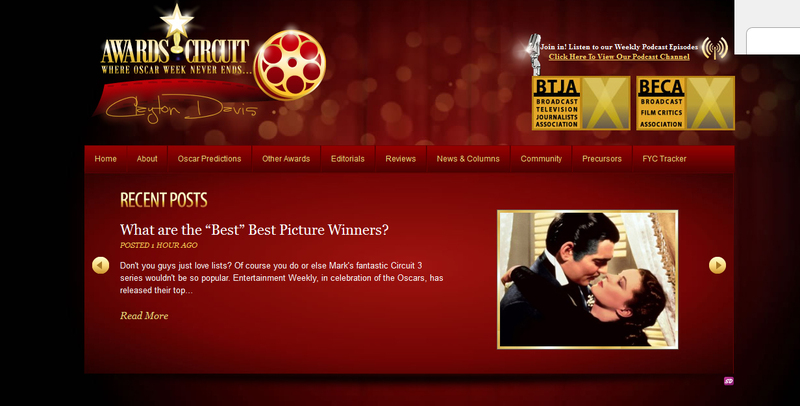 That’s the premise behind the Gold Derby website too – but this time the math is focused on who will win the Oscars. Filled with predictions, odds, graphs, category analysis – as well as a host of pictures – the site tries to give the very best guide possible as to who will win. For best picture, they’re reckoning that Argo will win the day – with Lincoln just behind and Silver Linings Playbook back in third. It’s not all bad news for those runners-up, though, with Daniel Day-Lewis in Lincoln and Jennifer Lawrence in Silver Linings both tipped for gongs. Spreading its net a little more widely than just the Oscars, Awards Circuit looks across a host of different awards. Oscars are the big time, though, so the site is full of predictions, editorials, columns, podcasts – all looking to Sunday’s big show. There are articles about who will win – and who should. There are trailers, photos, and an Oscar Tracker that keeps tabs on the changing likelihood of who will scoop the big awards. Beyond the Oscars, there are trailers and reviews of a host of other films too – so it makes the site a useful all-year-round visit too. Are the Oscars all about the fashion for you? Then head to the Red Carpet (oscar.go.com/red-carpet) where you’ll find talks with designers, pictures galore, Oscar surprises – even an Oscars App you can add to your phone. There are profiles of Oscar presenters, a Fashion Face/Off, video, blogs... you name it. There’s also a good Oscar history section, where you can brush up on enough information for those trivia quizzes! The Oscars are held tomorrow, starting at 7pm.